Following his vision of the Savior and his letters to the seven churches (see Revelation 1–3), John wrote about his visions concerning “things which must be hereafter” (Revelation 4:1). In the first of John’s visions that are recorded in Revelation 4–11, he saw God the Father enthroned in heaven, exalted beings who worship Him, and a book sealed with seven seals. John saw that the One who could open the book was Jesus Christ. John saw visions associated with the opening of the first six seals of the book, which symbolize the earth’s first six thousand years of temporal existence. In spite of the plagues and judgments that would come upon the earth’s inhabitants in the last days, John saw that those who were washed clean through the blood of the Lamb would be spared many of the destructions. John also recorded that prior to Christ’s Second Coming, two prophets would be slain in Jerusalem and then resurrected after three and a half days. Doctrine and Covenants 77 records the Lord’s answers to 15 key questions that help unlock some of the symbolism in chapters 4–11 of Revelation. “After that, John sees the seventh period of a thousand years, with great judgments poured out upon the earth, including Armageddon (see Rev. 8–9, 11, 16), which eventually lead to the utter overthrow of Babylon (see 17–18) and make way for the second coming of him who is King of kings and Lord of lords (see 19). Immediately following that, John sees Satan bound and Christ reigning for a thousand years (see 20:1–6), a last great battle between the forces of righteousness and evil (see 20:7–10), and the final judgment (see 20:11–15). Finally, a new heaven and a new earth are brought forth. (See 21:1–22:5. )” (“Seeing the Book of Revelation as a Book of Revelation,” Ensign, Dec. 1987, 52). In Revelation 4, John saw a vision of God the Father sitting on His heavenly throne, with 24 elders surrounding the throne. Modern scripture explains that these 24 elders were “elders who had been faithful in the work of the ministry and were dead; who belonged to the seven churches, and were then in the paradise of God” (D&C 77:5). This vision confirms the promises made to those who overcome evil as recorded in Revelation 2–3. The Joseph Smith Translation of Revelation 4:5 clarifies that the “seven lamps” are “the seven servants of God” (in Revelation 4:5, footnote a). The “sea of glass” mentioned in Revelation 4:6 represents “the earth, in its sanctified, immortal, and eternal state” (D&C 77:1; see also D&C 130:6–9). In John’s vision of the heavenly throne, he saw four beasts praising God. These four winged creatures described in Revelation 4:6–8 are similar to the heavenly beings described in Isaiah 6:1–3 and Ezekiel 1:5–14. Latter-day revelation explains the meaning of these beasts, as recorded in Doctrine and Covenants 77:2–4. In addition, the Prophet Joseph Smith (1805–44) taught: “The four beasts were four of the most noble animals that had filled the measure of their creation, and had been saved from other worlds, because they were perfect: they were like angels in their sphere. We are not told where they came from” (in History of the Church, 5:343–44). The various heavenly beings that John saw were all worshipping the Father. One of the truths taught in Revelation 4 is that exalted beings will continue to worship Heavenly Father in the eternities to come; He will always be our God (see D&C 76:21, 92–93). Elder Neal A. Maxwell (1926–2004) of the Quorum of the Twelve Apostles stated: “We will go on praising [the Lord] for ever and ever! … We will never need to be coaxed” (“From Whom All Blessings Flow,” Ensign, May 1997, 12). A modern replica of an ancient papyrus scroll sealed with multiple clay seals. Sealing an ancient document identified its owner and his authority, made the document legally binding, and protected it from unauthorized disclosure. Jesus Christ’s role as the only person worthy to open and read the sealed book highlights His authority as the executor of God’s plan of salvation. As John’s vision continued, he saw “a book written within on the backside, sealed with seven seals” (Revelation 5:1). Doctrine and Covenants 77:6–7 contains an explanation of the book with seven seals: “The first seal contains the things of the first thousand years, and the second also of the second thousand years, and so on until the seventh” (D&C 77:7). The One worthy to open the book with seven seals was called “the Lion of the tribe of Juda, the Root of David.” Both of these phrases are titles of Jesus Christ. “Lion of the tribe of Juda” is a fitting title because a lion is majestic and powerful and because the Savior was born through the lineage of Judah (see Genesis 49:8–10; Matthew 1:3; Hebrews 7:14). The title Lion of Judah is a stark contrast to the meek and sacrificial “Lamb” mentioned in verse 6. These two images convey that Christ possesses both majesty and meekness. Jesus is also called the “Root of David.” The Gospel writers frequently emphasized that Jesus was a descendant of King David (see Matthew 1:1; Mark 10:47; Luke 1:32; John 7:42). Later in John’s revelation, Christ Himself declared, “I am the root and the offspring of David” (Revelation 22:16). A root provides lifesaving water and nourishment to a plant﻿—such was the mission of Jesus Christ to all who accept Him as their Savior and Redeemer (see John 15:1–8; see also Isaiah 11:1; 53:2). A central message of Revelation 5 is that Jesus Christ, the Lamb of God, is the only One worthy to fulfill the work of God, which is represented by the book sealed with seven seals (see verses 1–4, 9, 12–13). Revelation 5 depicts several groups worshipping Christ, declaring His worthiness in song (see verses 8–14). For further explanation of Jesus Christ’s worthiness, see the commentaries for John 5:22, 27, 30 and for Hebrews 7:26. Lamb of God is a title of Jesus Christ. The Lamb that John saw bore the marks of one who “had been slain” (Revelation 5:6), evoking images of Christ’s sacrificial death by crucifixion (see Isaiah 53:7; 1 Peter 1:18–19; Revelation 13:8). The book of Revelation refers to Christ as a “Lamb” nearly 30 times. Elder Jeffrey R. Holland of the Quorum of the Twelve Apostles explained the significance of this name-title: “From Adam to the atonement of Christ, men were commanded to offer the firstlings of their flocks, that purest lamb without spot or blemish, as a similitude of the sacrifice that God the Father would make of his Firstborn, his Only Begotten Son who lived with perfection in the midst of imperfection” (“Whom Say Ye That I Am?” Ensign, Sept. 1974, 9). Left: Sacrificial Offering, by Ted Henninger. 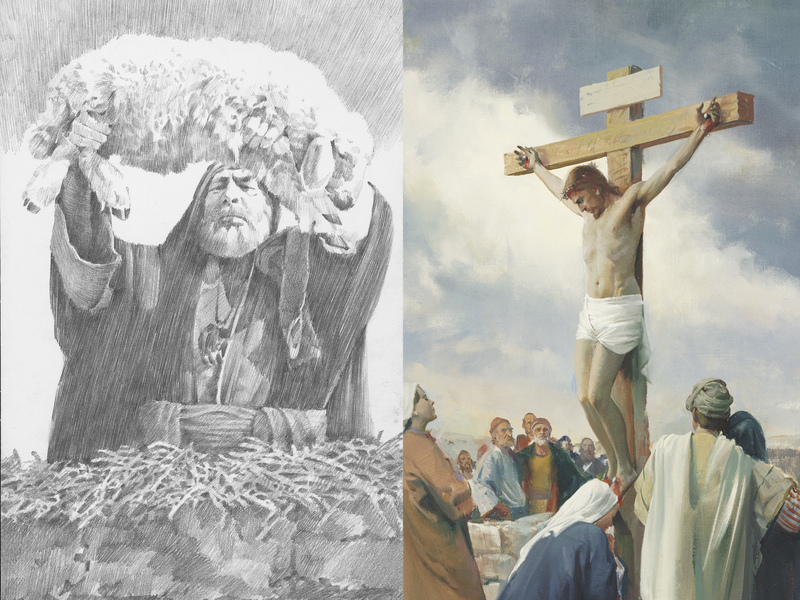 Right: The Crucifixion, by Harry Anderson. The book of Revelation refers to Christ as a lamb nearly 30 times. John described the Lamb in his vision as having many horns and eyes. In the scriptures, horns are often a symbol of power (see 1 Samuel 2:10; Psalm 75:10). Eyes often symbolize light and knowledge (see D&C 77:4). The Joseph Smith Translation of Revelation 5:6 indicates that the Lamb had “twelve horns and twelve eyes, which are the twelve servants of God” (in Revelation 5:6, footnote b). Since the Lord’s people in ancient Israel were numbered as twelve tribes and the Lord organized His Church with Twelve Apostles, the number twelve can symbolize divine government and organization, or the priesthood. This verse may suggest that all priesthood power and knowledge is centered in the Lamb of God. Revelation 5:9–10 declares that through the worthiness and redeeming blood of Jesus Christ, all people may be redeemed and crowned with glory to reign on the glorified earth as kings and priests. After quoting these verses, Elder Bruce R. McConkie (1915–85) of the Quorum of the Twelve Apostles explained that temple ordinances anticipate the fulfillment of these blessings: “Before the time when Christ shall reign personally upon the earth, the elect of God among every kindred, … having first believed the restored gospel, will go to the temples of God and receive the ordinances of exaltation whereby they qualify to become kings and priests” (in Conference Report, Apr. 1969, 144). For more information on kings and priests, see the commentary for Revelation 1:5–6. “I suppose John saw beings there of a thousand forms, that had been saved from ten thousand times ten thousand earths like this,﻿—strange beasts of which we have no conception: all might be seen in heaven. … John learned that God glorified Himself by saving all that His hands had made, whether beasts, fowls, fishes or men; and He will glorify Himself with them. “Says one, ‘I cannot believe in the salvation of beasts.’ Any man who would tell you that this could not be, would tell you that the revelations are not true. John heard the words of the beasts giving glory to God, and understood them” (in History of the Church, 5:343). As each of the seven seals of the book was opened, John saw visions concerning a thousand-year period of earth’s history (see D&C 77:7). Thus, the first seal related to the first thousand years of earth’s revealed temporal history (from about 4000 to 3000 B.C. ), and so forth. The following chart identifies the first six thousand-year periods and offers possible interpretations of the symbols John used to describe his visions. About 4000 to 3000 B.C. Commenting on Revelation 6:1–2, Elder Bruce R. McConkie said, “The most transcendent happenings” referred to in these verses “involved Enoch and his ministry. And it is interesting to note that what John saw was not the establishment of Zion and its removal to heavenly spheres, but the unparalleled wars in which Enoch, as a general over the armies of the saints, ‘went forth conquering and to conquer’ [Revelation 6:2; see also Moses 7:13–18]” ( Doctrinal New Testament Commentary, 3 vols. [1966–73], 3:477). About 3000 to 2000 B.C. As recorded in the scriptures, widespread wickedness and violence characterized this time period, which included the Great Flood during the days of Noah (see Genesis 6–11; Moses 7:24–43; 8:1–30). The rider of the red horse had power to “take peace from the earth, and that they should kill one another” (Revelation 6:4). “Or if it was not Lucifer, perhaps it was a man of blood, or a person representing many murdering warriors, of whom we have no record. Suffice it to say that the era from 3000 B.C. to 2000 B.C., was one of war and destruction” (Bruce R. McConkie, Doctrinal New Testament Commentary, 3:478). About 2000 to 1000 B.C. “A measure of wheat” would feed an adult for a day and cost a penny under these famine conditions. “Penny” is translated from the Greek word dēnarion, which referred to a Roman coin that some estimate was worth the typical daily wage of a laborer. A person could purchase only enough food to live on with a whole day’s wages, indicating extreme famine prices. In contrast, barley was less expensive and was thus eaten by the poor. As recorded in the scriptures, famines are characteristic of this time period (see Genesis 41–42; Abraham 1:30; 2:1, 17, 21). As recorded in the scriptures, great warring empires characterized this era: Assyria, Egypt, Babylon, Persia, Greece, and Rome. Having rejected the warnings of prophets such as Isaiah, Jeremiah, and Amos, the kingdoms of Israel and Judah often found themselves victims of these conquering empires. Israel and Judah also fought against one another. Many early Christians, including nearly all of the original Apostles, gave their lives as martyrs. John saw the Christian martyrs “under the altar,” suggesting that their lives were given in sacrifice to God’s service, much like the sacrificial animals offered upon the altar of the temple. Because they gave up their lives “for the word of God, and for the testimony which they held,” they were given “white robes,” symbolic of purity (see Revelation 7:13–14; 3 Nephi 27:19). This thousand-year period will continue until just before Jesus Christ returns in glory and reigns personally on the earth. John noted seven signs that will accompany this time period: an earthquake, the darkened sun, the moon becoming as blood, stars falling, the heavens opening as a scroll (see Joseph Smith Translation, Revelation 6:14 [in Revelation 6:14, footnote a]), mountains and islands moving out of their places, and men seeking to hide themselves. Similar signs of the times are recorded elsewhere in scripture (see Joel 2:10, 30–31; Haggai 2:6–7; D&C 29:14; 43:25; 88:87–91). Seven groups of men are also identified in these verses: kings, great men, rich men, chief captains, mighty men, bondmen, and free men. The number seven suggests completeness or wholeness: no enemies of God will escape His wrath in the last days. How does Revelation 7:3, 13–17 answer the question posed in Revelation 6:17? What do you need to do so that the description of the righteous in Revelation 7:14 can apply to you? The Lord gave Joseph Smith understanding concerning the angels mentioned in Revelation 7:1–2 (see D&C 77:8–9; see also D&C 38:12). Revelation 7:1 refers to four angels, the four corners of the earth, and the four winds of the earth. The number four in the scriptures often suggests a geographical fulness, as in the four directions on a compass. Regarding the angels of destruction, President Wilford Woodruff (1807–98) taught: “God has held the angels of destruction for many years, lest they should reap down the wheat with the tares. But I want to tell you now, that those angels have left the portals of heaven … and are hovering over the earth waiting to pour out the judgments. And from this very day they shall be poured out. Calamities and troubles are increasing in the earth, and there is a meaning to these things. Remember this, and reflect upon these matters. If you do your duty, and I do my duty, we’ll have protection, and shall pass through the afflictions in peace and in safety” ( The Discourses of Wilford Woodruff, sel. G. Homer Durham , 230). The sealing or marking of “the servants of our God in their foreheads” is a metaphor of their devotion, service, and belonging to God (Revelation 7:3; see also Revelation 9:4; 14:1). “Seal” is the same term used earlier in the New Testament to describe faithful, baptized Saints who had received the Holy Spirit of Promise (see 2 Corinthians 1:22; Ephesians 1:13; 4:30). Bearing this seal protects the faithful from divine judgments upon the wicked (see Revelation 9:4; 16:2). In this sense, the seal of God in the forehead symbolizes a protection much like the lamb’s blood that ancient Israelites in Egypt placed on their door frames to protect them from the destroying angel (see Exodus 12:13). The Prophet Joseph Smith taught that the sealing of the faithful in their foreheads “signifies sealing the blessing upon their heads, meaning the everlasting covenant, thereby making their calling and election sure” (in History of the Church, 5:530). For more information on God’s name written in the forehead of the righteous, see the commentary for Revelation 22:4. In Doctrine and Covenants 77:11 the Lord explained to Joseph Smith that the number 144,000 mentioned in Revelation 7:4–8 is the number of representatives out of the twelve tribes of Israel who will be ordained to assist others in their quest for exaltation (see the commentary for Revelation 14:1–5). It is not, as some people believe, the total number of people who will be exalted. “The church of the Firstborn” refers to those who will be exalted and become joint-heirs with Jesus Christ (D&C 77:11). Members of the Lord’s earthly Church﻿—The Church of Jesus Christ of Latter-day Saints﻿—who live righteously and receive the ordinances of exaltation will become members of the Lord’s heavenly Church﻿—the Church of the Firstborn (see D&C 93:20–22). John saw that the multitude of exalted people clothed in white robes was too large to count and came from all nations of the earth. The image of the righteous with palm branches in their hands recalls the Savior’s triumphal entry into Jerusalem (see Matthew 21:1–9; John 12:12–15). Palm branches can symbolize victory and joy (see D&C 109:76). The image of robes washed and made “white in the blood of the Lamb” (Revelation 7:14) refers to our being purified through the Atonement of Jesus Christ (see Alma 5:21; 13:11–12; 3 Nephi 27:19). While serving as a member of the Seventy, Elder Lynn A. Mickelsen taught: “The Savior stands at the door and knocks; He is ready to receive us immediately [see Revelation 3:20]. Our responsibility is to do the work of repentance. We must abandon our sins so the cleansing can begin. The promise of the Lord is that He will cleanse our garments with His blood [see Revelation 7:14]. He gave His life and suffered for all our sins. He can redeem us from our personal fall. Through the Atonement of the Savior, giving Himself as the ransom for our sins, He authorizes the Holy Ghost to cleanse us in a baptism of fire” (“The Atonement, Repentance, and Dirty Linen,” Ensign or Liahona, Nov. 2003, 12). According to these verses, what blessings will be enjoyed by those whose robes are washed “white in the blood of the Lamb”? (Revelation 7:14). Which of these blessings means the most to you? John beheld a short period of silence when the seventh seal was opened﻿—a time when the angels of heaven are awaiting the command to execute the Lord’s justice (see Revelation 8:1; D&C 38:11–12; 88:95). Zephaniah described a similar period of silence that preceded the ancient destruction of Judah (see Zephaniah 1:7–18). The Lord’s judgment and intervention are described as times when the Lord does not keep silent (see Psalm 50:3–4; Isaiah 65:6). Following this period of silence, John saw fire and desolation poured out during the seventh seal and preceding the Second Coming of Christ. Because the number seven often symbolizes completion, the destructions of the seventh seal may be seen as preparing for the completion of God’s work on earth (see D&C 77:12). These destructions are described in Revelation 8:6–9:21; 11:1–19. The structure of Revelation 8–11 focuses on seven angels, whose blasts on their trumpets bring calamitous judgments upon the earth. Doctrine and Covenants 77:12 states that “the sounding of the trumpets of the seven angels are the preparing and finishing of [Christ’s] work, in the beginning of the seventh thousand years﻿—the preparing of the way before the time of his coming.” The following chart summarizes the calamities that John saw in these chapters. Third part of trees and all green grass are burnt up. “Hail and fire mingled with blood … were cast upon the earth” (Revelation 8:7). “Speculatively, most of the plagues and destructions here announced could be brought to pass by men themselves as they use the weapons and armaments they have created” (Bruce R. McConkie, The Millennial Messiah , 382). Third part of the sea becomes blood; third part of living creatures of the sea die; third part of ships are destroyed. “A great mountain burning with fire was cast into the sea” (Revelation 8:8). “Perhaps the turning of the waters of Egypt to blood was in similitude of this great latter-day plague. (Ex. 7:19–25. )” (Bruce R. McConkie, Doctrinal New Testament Commentary, 3:499). Third part of rivers and waters are made bitter; many men die. “There fell a great star from heaven, burning as it were a lamp” (Revelation 8:10). “Could this result from atomic fallout or pollutions from the factories of the world? Or will it be brought to pass by some law of nature beyond our control?” (Bruce R. McConkie, Millennial Messiah, 383). Third part of the sun, moon, and stars are smitten and darkened. No destroying agent mentioned. “Perhaps a merciful God withholds from us the ways and the means whereby the very luminaries of heaven will cease to serve their ordained purposes” (Bruce R. McConkie, Millennial Messiah, 383). The sun and air are darkened; those without the seal of God are tormented for five months. “There arose a smoke out of the pit. … And there came out of the smoke locusts upon the earth” (Revelation 9:2–3). “Lucifer opens the doors of hell, and every vile influence ascends from its evil depths as does smoke from a great furnace. So dark is the smoke and so widespread is the evil that the sun and the air are darkened” (Bruce R. McConkie, Millennial Messiah, 384). Third part of men are killed. Four angels who are prepared to slay one-third of men. “Four angels of the devil, demons from the depths of hell, are given free reign to lead the armies of men in destroying a third of the population of the earth” (Bruce R. McConkie, Millennial Messiah, 386). Those who destroy (corrupt, waste, pervert) the earth are destroyed. The Lord Himself. “Lo, the Great Millennium cometh! And Christ reigneth! ‘And the Lord shall be king over all the earth: in that day shall there be one Lord, and his name one.’ (Zech. 14:9.) In that day he shall make ‘a full end of all nations’ (D. & C. 87:6), as he said: ‘I will be your ruler when I come’ (D. & C. 41:4); and, ‘Ye shall have no laws but my laws when I come, for I am your lawgiver.’ (D. & C. 38:22. )” (Bruce R. McConkie, Doctrinal New Testament Commentary, 3:512). After the seventh seal was opened, John saw an angel take “fire of the altar, and cast it into the earth” (Revelation 8:5). Elder Bruce R. McConkie stated that “the hot coals, taken from the altar and cast down to earth, symbolize the judgments of God to be rained down upon the wicked during the opening part of the seventh seal” ( Doctrinal New Testament Commentary, 3:499). When the third angel sounded the trumpet, “there fell a great star from heaven, burning as it were a lamp”; John identified this star as “Wormwood” (Revelation 8:11). Wormwood was a plant with an extremely bitter taste. The star named Wormwood that fell from heaven may symbolize the bitterness and awfulness that comes to all who follow the devil. Elder Bruce R. McConkie discussed the meaning of the three woes: “After showing John the woes that would befall mankind before the Second Coming (Rev. 6:9–17; 7; 8:1–13), the Lord by an angelic ministrant promised three more woes, which were to attend and usher in the reign of the Great King. (Rev. 8:13.) The first of these was the unbelievably destructive series of wars leading up to the final great holocaust. (Rev. 9:1–12.) The second was the final great war itself in which one-third of the hosts of men should be slain. (Rev. 9:12–21; 10; 11:1–14.) And now the third woe is to be the destruction of the remainder of the wicked when the vineyard is burned by divine power and the earth changes from its telestial to its terrestrial state” ( Doctrinal New Testament Commentary, 3:511). Revelation 9:1 symbolically describes the final efforts of Satan and his followers prior to the final destructions of the wicked. Satan is depicted as a star fallen from heaven (see also Isaiah 14:12–17; Revelation 12:9). The Joseph Smith Translation clarifies that the key was given not to Satan but “to the angel” (in Revelation 9:1, footnote a), who then opened the bottomless pit. This reading emphasizes that God has ultimate control and that Satan has power only as God allows. At the beginning of the Millennium, God will bind Satan and his followers (see Revelation 20:1–3; D&C 43:29–31). The smoke in Revelation 9:2–3 is reminiscent of the mists of darkness in Lehi’s vision of the tree of life (see 1 Nephi 8:23; 12:17). The smoke that emerges from the bottomless pit darkens the skies, similar to how the mists of darkness in Lehi’s vision obscured view of the tree of life. The smoke may allude to all of Satan’s false philosophies, temptations, deceptions, and attempts in the last days to destroy righteousness upon the earth (see D&C 93:39). “Someone has said it was not raining when Noah built the ark. But he built it, and the rains came. “The Lord has said, ‘If ye are prepared ye shall not fear’ (D&C 38:30). “We can so live that we can call upon the Lord for His protection and guidance. This is a first priority. We cannot expect His help if we are unwilling to keep His commandments” (“If Ye Are Prepared Ye Shall Not Fear,” Ensign or Liahona, Nov. 2005, 62). Though the Lord promises protection to the righteous in the last days, the Prophet Joseph Smith clarified that some who are righteous may lose their lives in the trials and calamities of the last days: “[I] explained concerning the coming of the Son of Man; also that it is a false idea that the Saints will escape all the judgments, whilst the wicked suffer; for all flesh is subject to suffer, and ‘the righteous shall hardly escape’ [see D&C 63:34]; still many of the Saints will escape, for the just shall live by faith [see Habakkuk 2:4]; yet many of the righteous shall fall a prey to disease, to pestilence, etc., by reason of the weakness of the flesh, and yet be saved in the Kingdom of God” ( Teachings of Presidents of the Church: Joseph Smith , 253). “John here seeks to describe a war fought with weapons and under circumstances entirely foreign to any experience of his own or of the people of that day. Joel, subject to the same limitations of descriptive ability, attempted to portray the same scenes in [the words found in Joel 2:1–11]. “It is not improbable that these ancient prophets were seeing such things as men wearing or protected by strong armor; as troops of cavalry and companies of tanks and flame throwers; as airplanes and airborne missiles which explode, fire shells and drop bombs; and even other weapons yet to be devised in an age when warfare is the desire and love of wicked men” ( Doctrinal New Testament Commentary, 3:502–3). John recorded in Revelation 9:15–16 that terrible destruction will be unleashed by God’s messengers during the last days before the Savior’s Second Coming. John declared that “two hundred thousand thousand” (200,000,000) men of war will fight in the battle of Armageddon (verse 16). We do not know whether that number is symbolic or literal. John also recorded that “the third part of men” will be slain (verse 15). Of this prophecy, Elder Bruce R. McConkie stated, “The slain will be a third of the inhabitants of the earth itself, however many billions of people that may turn out to be” ( Millennial Messiah, 453). What are some of the sins John said would be prevalent during the period of the seventh seal, prior to the Second Coming of Jesus Christ? What are you doing to distance yourself from these sins or “anything like unto” them? (D&C 59:6). What more could you do to “stand in holy places”? (D&C 45:32). “Seduced by our culture, we often hardly recognize our idolatry, as our strings are pulled by that which is popular in the Babylonian world” (“Zion in the Midst of Babylon,” Ensign or Liahona, May 2006, 91–92). Among the sins that the wicked in the last days will not repent of will be sorcery. President James E. Faust (1920–2007) of the First Presidency counseled Latter-day Saints to avoid becoming involved in sorcery or other satanic practices: “It is not good practice to become intrigued by Satan and his mysteries. No good can come from getting close to evil. Like playing with fire, it is too easy to get burned: ‘The knowledge of sin tempteth to its commission’ [Joseph F. Smith, Gospel Doctrine, 5th ed. (1939), 373]. The only safe course is to keep well distanced from him and any of his wicked activities or nefarious practices. The mischief of devil worship, sorcery, witchcraft, voodooism, casting spells, black magic, and all other forms of demonism should always be avoided” (“The Forces That Will Save Us,” Ensign, Jan. 2007, 5). A “mighty angel” delivered “a little book” to John, and he “ate it up” (Revelation 10:1–2, 10), symbolizing his mission to help “gather the tribes of Israel” as part of the Restoration (D&C 77:14; see also D&C 7:1–3). Eating the book may suggest that John accepted his mission: it became a part of his being. That the book was “sweet as honey” in John’s mouth but “bitter” in his belly (Revelation 10:10) may suggest that his mission would involve many sweet and joyous experiences but also rejection and painful experiences (see also Psalm 119:103). Ezekiel also ate, or internalized, a book (see Ezekiel 2:6–3:3). According to John Whitmer’s account of a conference of the Church in June 1831, “the Spirit of the Lord fell upon Joseph in an unusual manner, and he prophesied that John the Revelator was then among the Ten Tribes of Israel who had been led away by Shalmaneser, king of Assyria, to prepare them for their return from their long dispersion, to again possess the land of their fathers” (in History of the Church, 1:176). Elder Bruce R. McConkie described what the “seven thunders” mentioned in Revelation 10:3–4 might represent: “The seven thunders which here utter their voices are the seven angels reciting in some detail that which is to be in each of the thousand year periods of the earth’s temporal continuance” ( Doctrinal New Testament Commentary, 3:505). Close-up of a model of the Jerusalem temple. In Revelation 11:1–2, John was commanded to “measure” the temple, the altar, and the worshippers. This command can indicate that the temple and the worshippers are under God’s protection. The angel told John that Jerusalem would be trodden “under foot forty and two months” (Revelation 11:2). Forty-two months is the equivalent of three and a half years. Likewise, the two witnesses mentioned in verse 3 would prophesy and testify of Jesus Christ for 1,260 days, or approximately three and a half years. They would be slain, and their bodies would lie in the street for three and a half days (see verses 8–11). In the scriptures, particularly in Revelation, the number three and a half often describes a limited period of tribulation during which evil forces are allowed to do their work (see Daniel 7:24–25; 12:7; Luke 4:25; Revelation 11:2–3, 9–11; 12:14; 13:5). Since three and a half is half of seven (which symbolizes perfection and completion), it may represent imperfection and apostasy. It may also suggest that God will not allow evil to go on unchecked: evil’s time is bounded and its limits are set. The events in Revelation 11 will transpire prior to the Savior’s coming to the Mount of Olives to deliver the Jews from destruction (see Zechariah 14:4–7; D&C 45:47–53). The “two witnesses” (Revelation 11:3) are “two prophets that are to be raised up to the Jewish nation in the last days, at the time of the restoration, and to prophesy to the Jews after they are gathered and have built the city of Jerusalem in the land of their fathers” (D&C 77:15; see also Isaiah 51:19–20; Zechariah 4:3, 11–14). These two prophets appear to possess the sealing power of the priesthood, with which they (like prophets before them) are able to control the skies and smite the earth with plagues (see 1 Kings 17:1; Helaman 10:6–11; Moses 7:13–17; Joseph Smith Translation, Genesis 14:30–31 [in the Bible appendix]). Elder Bruce R. McConkie stated, “No doubt they will be members of the Council of the Twelve or the First Presidency of the Church” ( Doctrinal New Testament Commentary, 3:509). In Revelation 5:9–13, the heavenly hosts sang a song of praise to the Lord Jesus Christ, the Lamb of God. If you were to choose a hymn to praise the Lord, which hymn would you choose? What attributes of Jesus Christ inspire you to sing praises to Him? If you were to compose a hymn of praise about Jesus Christ, what would the lyrics emphasize? Though there is much in these chapters in Revelation that may cause some to feel anxiety, what in these chapters gives you hope and confidence for the future? What did you learn about qualifying for the protection of the Lord? Revelation 7:14 suggests that those who will be in the celestial kingdom will have passed through “great tribulation” in their lives. Write a paragraph or two describing how tribulation has brought you nearer to God. Then read 1 Nephi 12:10–11; 3 Nephi 27:19; and Alma 13:12. Discuss what disciples of Jesus Christ need to do in order to “[wash] their robes, and [make] them white in the blood of the Lamb” (Revelation 7:14).